Dr Winston McGarland Bailey. The Mighty Shadow died just four days before he could officially be bestowed with this latest accolade, but that did not stop the University of the West Indies, St Augustine campus from celebrating his legacy. 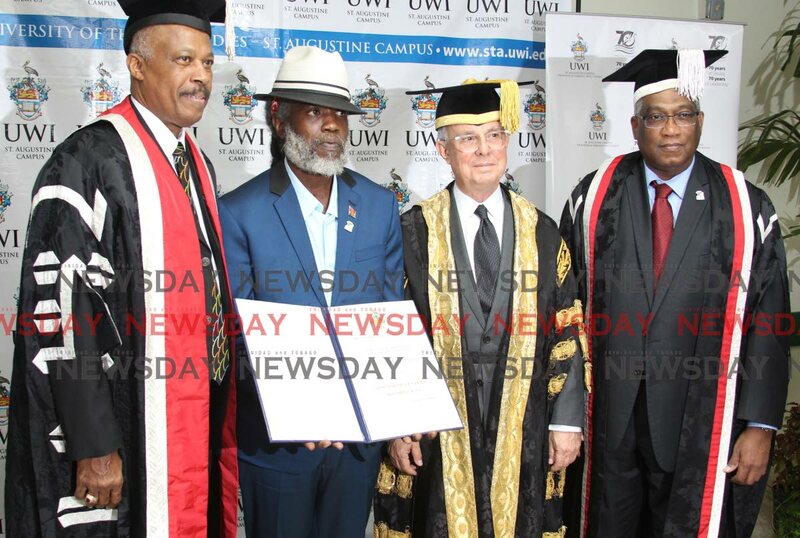 The calypso legend was posthumously awarded an honorary Doctor of Letters degree by the university at its graduation ceremony yesterday, and according to his son, Sharlan Bailey, as the day drew nearer, so did his father’s eagerness for the moment pique. “You could see the excitement as he was starting to prepare what he would perform. For a long time I didn’t see that excitement in him,” said Sharlan. Sharlan—a musician, producer and an almost doppelganger for his father— stepped in at the last moment, performing the song Shadow had chosen to represent his achievement. “He was a little worried about what he would perform but One Love has always been a song he lived by,” Sharlan said. The moment was bittersweet for Sharlan, though, who would have much preferred his father collect this lifetime achievement. “I guess I had to do it because that’s what he was going to do. It’s hard. The whole ride has been an emotional one because I’ve been with him on this journey with we got the news,” he said. In fact, Sharlan said before he died, Shadow had been working on new music—although it’s unlikely any will be released. “When he decided to record new material it wasn’t because he felt the necessity to release the material but because he was a writer,” he said. Nevertheless, Sharlan was proud of his father’s achievement. “It’s a nice high level of respect for what he has done. This is an artiste who has been relevant for the past five decades and has had hits in every one. He was battling the Mighty Sparrow and Lord Kitchener from the start, and then later in life, went on to battle Machel Montano and Bunji Garlin. No other calypsonian has that track record,” Sharlan said. Shadow’s career has never been like a typical calypsonian, about titles and crowns, he added, but as an artist whose creative ability was out of this world. Calypsonian Lutalo Masimba, known as Brother Resistance, said Shadow’s award was a “powerful moment for the music industry.” “For the storytellers out there stressing themselves, they should not—just hold on and keep doing what you are doing. This is an honour not just for TT but for calypso lovers all over the world. Shadow was an artist that meant so much for the people of this county, the region and the world because he has spoken to them directly from the heart so his music, lyrics image resonate,” he said. Shadow’s funeral will be held on Tuesday at 10 am at the Queen’s Park Savannah, Port of Spain. Reply to "One love for ‘Dr Shadow’"